Larimar is a rare blue variety of pectolite found only in the Dominican Republic. Sometimes called the Dolphin Stone, Larimar mirrors the beautiful waters that surround it’s island of origin. Connected to the ancient wisdom of Atlantis, this stone raises consciousness, and opens the way to the ‘divine stair of ascension’ allowing one’s true pathway in life to be revealed. 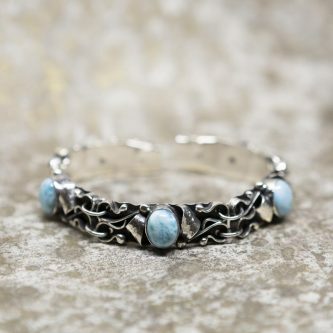 Linked with the goddess energies of Sea and Sky, Larimar helps women to call upon the goddess within to fully manifest their highest purpose in life.